This is the first of a massive, five-volume anthology of texts running from the fourth through fifteenth centuries, compiled on Mount Athos in the eighteenth century by St Nikodimos of the Holy Mountain and St Makarios of Corinth. Of the five, only the first four have been translated into English; Kallistos Ware says he needs to start refusing speaking engagements so they can finish the fifth. This volume begins in the fourth century and includes texts into the seventh; therefore, this volume (and the next, at least) is part of the common heritage of both western and eastern Christians. Palmer, Sherrard, and Ware have done an inestimable service to the English-speaking world in providing us with this rich collection of documents, that represent a core of the Eastern Orthodox tradition that has exerted a powerful influence since its publication in 1782 (on which see Andrew Louth, Modern Orthodox Thinkers: From the Philokalia to the Present Day). The translation is clear and lucid, and the editorial material provides many aids to the reader. These aids are, in my opinion, essential to understanding texts so far removed from us in time, space, and situation. We are not desert hermits or monks. Many of the readers of this volume are, rather, urban laity with little or no monastic context. Many of us, moreover, are not even Orthodox. In fact, the Introduction and the Glossary are themselves an education in hesychastic spirituality (on which, more below). The main themes of the text and its function are introduced in the former, and the ancient Greek Christian understanding of a variety of important, specific terms is provided in the latter. Moreover, we are reminded that these texts alone are not the entirety of the path to holiness these authors themselves were on: many of them lived in communities, they celebrated the liturgy, they practised acts of mercy, they read Scripture, and so on. And many of them wrote texts on other topics not included because they are not the focus of The Philokalia. The specific focus of The Philokalia is the prayer of the heart, or inner prayer, which is cultivated and practised as essential on the road to hesychia — peace, calmness, stillness, silence. Practical considerations are here, such as Evagrios the Solitary counselling against the eight wicked thoughts (later, seven deadly sins in the western tradition) in his treatise ‘On Prayer’. Elsewhere, Hesychios the Priest gives an extended series of chapters on ‘watchfulness’. Watchfulness, in fact, may be the watchword for attaining hesychia in Philokalic spirituality. We are called to watch our thoughts, guards our hearts, be on the lookout for temptation. We are counselled to bring to mind the stories of Scripture, both the examples of the saints therein and the life and deeds of Christ. We are reminded to meditate on the grace of God as we have experienced it in our own lives. We are called to focus on and pray the Name of Jesus. All of these, arguably, are forms of watchfulness. Either they are the mind itself watching for danger and fleeing from danger, or they are the mind occupying itself with things above, and thus being prepared for temptation or a wicked thought when it comes. Many of these texts are difficult. Well, maybe all of them are. This is not an easy book. It took my two years to read it, after a first failed attempt 12 years ago. Much of the content is either not applicable to us or hard to apply. Discernment of what is wisdom for the urban layman is required. Watchful, attentive reading and prayer must come here alongside humility. I suspect that many will give up, either judging the authors of these writings for not being their own breed of Christian or just finding it too hard. I understand. I also counsel you: Keep going. One difficulty you will face is simply a matter of genre. Many of these are collections of short sayings, from a sentence to a paragraph. They are not always arranged in a visibly logical way. It can be hard to read many of them at once. I recommend reading only as many as you can take at once and meditating on them. I also, on my third reading of Evagrios ‘On Prayer’, took notes and tried to find structure and meaning within the texts. These are, for the most part, not extended discussions or discursive essays properly united with a theme and an argument. Simply be ready for that. This volume includes selections from: St Isaiah the Solitary, Evagrios the Solitary (aka Pontikos), St John Cassian (the only Latin in the whole five volumes), St Mark the Ascetic (aka Mark the Monk), St Hesychios the Priest, St Neilos the Ascetic (of Ancyra), St Diadochos of Photiki, and St John of Karpathos, as well a barely Christianised Neoplatonic text attributed to St Antony the Great. The only thing I wish were here is the original introduction by St Nikodimos of the Holy Mountain. I did it! 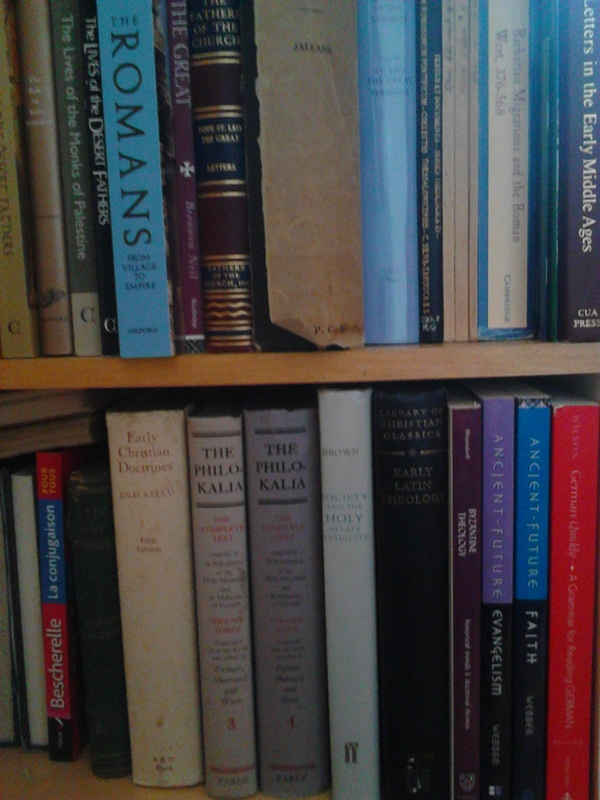 Twelve years after my first attempt, and two years after the start of my second, I finished The Philokalia, Vol. 1 this Lent! Well done, me! I mean, how many people can boast that, after all? Sure, people read the Rule of St Benedict, or St Augustine’s Confessions, or, say, the Bible all the time. 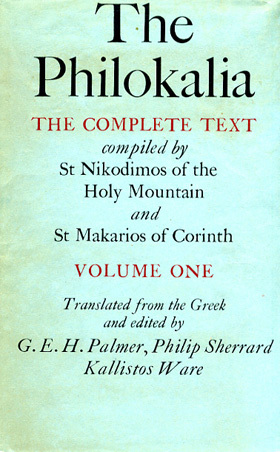 But, really, to struggle through the difficult content of the first volume of The Philokalia in any language is something of an achievement in the world of devotional reading. After all, it took me two years. Off and on, that is. Mind you, it’s not as though I spend very much time praying the Jesus Prayer. It’s not as though I spend my life in ‘watchfulness’. Given how quickly I grow annoyed or impatient, I don’t think I have that much hesychia. And those eight deadly thoughts (logismoi) that Evagrius talks about so much? Probably all here, not really being resisted that much. I hope it has been good for me to read this book, and reread some sections of it. I think I’ve read Evagrius On Prayer four times now. I am sure I could profit from another read. I know that I do, at times, reflect on teachings from this book and how they’ve helped me. Just because I have read a (difficult) devotional book and occasionally apply its lessons does not make me holy. Practising holiness is what makes us holy. The grace of God is what makes us holy. Could we put together a Latin Philokalia? Could we do this for Latin Christianity? I suppose it would take a saint like St Nikodimos of the Holy Mountain to properly sift the vast amount of Latin Christian spirituality that is out there to consider. I would want to keep it pre-Reformation and post-Constantine, similar boundaries to the Greek Philokalia. The first difficulty is discerning a common thread to unite the texts selected. Not all of Greek spiritual thought is in The Philokalia, after all — there are certain concerns that have been chosen. 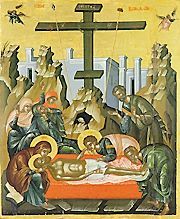 Thus, one of the most popular of all Greek ascetic texts, The Ladder by St John of Sinai (aka The Ladder of Divine Ascent by St John Climacus), is not there. Nor are swathes of St Maximus the Confessor. No hagiography. No liturgy. No monastic rules. No Cappadocian Fathers. No St Athanasius. No St Cyril. No Ante-Nicene Fathers. No Pseudo-Dionysius. Anyway, who are the neptic Fathers of Latin Christianity? I’m not sure, but as an initial brain-storm, perhaps a prayerful exploration of theses guys would be good. Remember, we’re thinking selections with a theme, not the Complete Works. I know many would want to see, say, Meister Eckhart in the list, but I don’t know enough about his works to know if he’s worth searching for a common thread of Latin spirituality running from Jerome to the Renaissance. On the other hand, I know that, while Julian of Norwich is worth reading, her work is of a specific nature and, I think, very distinct from the tradition that links Bernard and Aelred with Cassian and Augustine. Indeed, the late medieval mystics are hard. What about St Catherine of Siena? I’ve yet to read The Cloud of Unknowing. Would any of it fit? Likewise, the scholastics. Bonaventure, sure. St Thomas Aquinas? Or the pre-scholastic Anselm: I love him, but I don’t think he belongs, even if he was a practicioner of the tradition from Julianus Pomerius to the Cistercians. My own inclinations lean towards Cistercians more than scholastics for this, but maybe that’s false? Of course, should we cut it short with the Reformation? Will we suffer for the lack of Sts John of the Cross and Teresa of Ávila? Just some thoughts. It is at least an interesting thought experiment. Maybe a way to make a personal reading list, even if not a multi-volume anthology. Today I read John of Karpathos’ second text in The Philokalia, the ‘ascetic discourse’, also addressed to encourage the despondent monks of India (Ethiopia). Frankly, this work is an example of what is wrong with much in the monastic movement. John’s way of encouraging them to stay in the monastery is to argue that life in the world, with marriage and children, is lesser, that has less merit before God, that people ‘in the world’ live according to the passions, whereas the monastery is where asceticism happens and where true blessedness is found. As a husband and father, I can assure this ascetic that there is an asceticism of marriage and an asceticism of parenthood. Is not the heart of ascetic labour, ‘Take up your cross daily, deny yourself, and come, follow me’? How is the married estate excluded? Now, if you are a newcomer, fear not: I don’t hate monasticism, and I know that not all monks think that they’re holier than us. I have no doubt many of them are, but not because of their monastic profession. Rather, it is their faithfulness in discipleship in their vocation, just as it would be for a holy married person. But it still rankles when I read it. This season has not been the best. This past Saturday I received a rejection letter from a two-year postdoc that was the position I most wanted this coming year. And yesterday I was rejected by a one-year postdoc that I also fervently desired. My current job ends at the close of August, so academic work is not simply a matter of building my career or living my dream but of survival for my family. This is not an easy season, Lent or not. Lent hasn’t really been working very well, either. We were travelling the Thursday after Ash Wednesday, and I had a lecture to finish preparing and then to deliver that evening, so I missed any Ash Wednesday service. Besides the Lent Book Poll resulting in finishing off The Philokalia, Vol. 1, as my Lenten reading, I didn’t really pray or think about a discipline or abstinence of any sort. So I’ve felt a bit off to begin with. Whatever you’re facing, may you have strength to carry on today. I am around seven pages from completing the next text in The Philokalia, Vol. 1: Diadochos of Photiki, ‘On Spiritual Knowledge’. Diadochos, a strong supporter of Chalcedon against its Mia/Monophysite opponents, died in the year 486 and was known to both Julianus Pomerius (d. 499×505) who wrote On the Contemplative Life and was spiritual father to Caesarius of Arles, and Victor of Vita, author of The History of the Vandal Persecutions. Diadochos is usually mentioned as one of the earliest writers on the Jesus Prayer (a prayer that I practise and which features on this blog at times as a result). 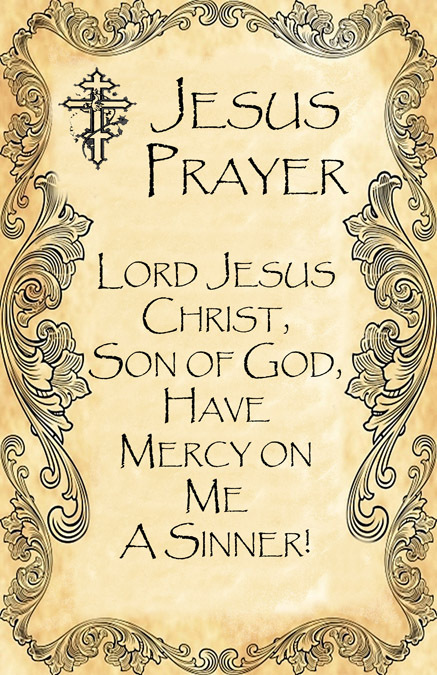 The prayer of that name we usually mention is, ‘Lord Jesus Christ, Son of God, have mercy on me, a sinner.’ It contains all of theology. It is named in The Philokalia first by St Hesychios the Priest (7th or 8th c.); another early Philokalic writer who mentions it (but not in The Philokalia) is St Neilos, with whom we spent last week and the week before. See also chapters 61, 73, 81, 85, and 88. I want to pause on the second of the passages above. This is not what any of us will hear on Sunday from an evangelical Protestant pulpit. I am not entirely certain that I buy all of Diadochos’ interpretation and application of Scripture here. Nonetheless, rich blessings can be found by thinking on passages such as this. First: Jesus is the Word (logos) of God, with God from the beginning as we read in John 1 (even though there is no beginning or end with God, as St Gregory of Nazianzus reminds us). God the Word became incarnate as a person with the name of Jesus, God saves (as Matthew tells us). At the name of Jesus every knee shall bow (Phil. 2:10). Is there not a fittingness that the name, the word, that we use to denote the Word of God incarnate would have power? Second: If we accept a sacramental worldview, as I do (as does the BCP and the 39 Articles), the grace of God can be manifest and intermediated in any number of ways to us. We don’t always like this, of course. As Chris R Armstrong argues in the introductory chapter of Medieval Wisdom for Modern Christians, anglophone evangelicals don’t want any intermediaries ever between us and God. We want immediacy. So the idea that simply by saying, ‘Lord Jesus’, God can be mediated to us — that sticks in the throat. But — well, if you confess with your mouth that Jesus is Lord and believe in your hear that God raised Him from the dead, you will be saved (Romans 10:9). Is not, then, ‘Lord Jesus!’ as a cry, as a prayer, as a remembrance, an act of recollection, from the Holy Spirit as Diadochos argues from 1 Corinthians? And why should God not choose to honour that as a most eloquent prayer? Elsewhere in this treatise, Diadochos notes our inability pray properly, which is why the Spirit intercedes for us with groanings (Romans 8:26). So perhaps, ‘Lord Jesus!’ is all we need. Not only this, but is this not the very Name of God Himself? Why should it be bereft of power and grace and mercy? Why should God choose to visit us in a piece of bread, a sip of wine, the water of baptism, the text of Scripture but not in His Own Name? Third: ‘Lord Jesus’ contains within it all of Christology. Here are two words worthy of meditation! Only God is Lord, we know this from the Old Testament. The shortcut logic (if you want all the history and logic up to Chalcedon, read A. Grillmeier, Christ in Christian Tradition, vol. 1, or c. 300-381, R. P. C. Hanson, The Search for the Christian Doctrine of God), but the shortcut logic is: Jesus must be God. Jesus is also human. Jesus is the Godman. Bow down and worship. Think on this. Meditate. Love Jesus. Pray through these words. How could God not communicate his grace to us through these two words?